Network Ten has denied it is “padding” its audience for Family Feud by refusing to release a channel-by-channel audience breakdown for the gameshow which is being simulcast across its three channels for its launch week. 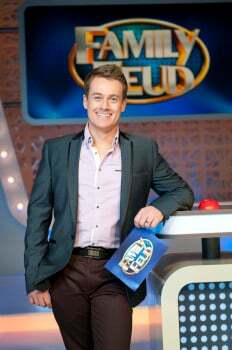 On Monday, Ten announced it would air the revived gameshow across all of its channels, Ten, One and Eleven, for the first week of broadcast in a bid to gain as much exposure as possible for the show, which is hosted by Grant Denyer, with the show rating with 690,000 viewers on its Monday debut, rising to 719,000 on Tuesday and then recording an audience of 657,000 last night. Media buyers who spoke to Mumbrella welcomed the strong performance for the show, but some questioned the decision by the network to use just one code with OzTam across the channels making a breakdown of audience numbers for each of the channels impossible. Yesterday news website Crikey criticised the move with TV writer Glenn Dyer arguing: “It’s not against the rules, but it is poor form”, and noting that other channels, such as the ABC, do not generally use one Oztam code when they simulcast while TV Tonight had questioned whether the move runs the risk of being “overkill” on audience promotion. Ten’s chief programming officer, Beverley McGarvey today rejected these criticisms saying: “There is no ‘padding’ of numbers at all. That is ridiculous. We are simulcasting Family Feud across Ten, Eleven and One, and the OzTAM numbers show many people are watching the show. “Network Ten has always been known for its innovation. The innovative scheduling of Family Feud this week at the same time across our three broadcast channels gives us a way to bring this exciting new show to as many people as possible. All the media buyers who Mumbrella spoke to welcomed the uplift in audience, which has seen the station lift its main channel above the 300,000-400,000 mark that Modern Family had been achieving in the slot, although the precise extent of the rise will not be clear until Tuesday when the first non-simulcast broadcast numbers are released. Group media investment director at Aegis Media Alex Pekish echoed these remarks arguing that simulcast was a clever strategy. PHD’s Sydney managing director Toby Hack said Ten should be commended for breathing new life into an old format. “Ten has done quite well (this week) and I think they should be please with what they have achieved, he said. “I think they should be applauded for trying to reestablish this well known brand, it is a well known brand and format that has been reinvented. Other buyers were optimistic but cautious and eager to see the full non simulcast numbers next week. “Ten are not the dominant station and so they have to pull out all the tricks. They don’t have the continual one million plus audiences to continue to promote their shows,” said one media buyer, who also declined to be named. “It’s not a bad tactic to show people what is on the station,” said another buyer, “But it feels like a case desperate times call for desperate measures but sometimes that brings about innovative solutions. TV programme debuts live and die on trial. This ‘enforced’ trial is clever (as long as it remains trial and they revert to normal programming). I bet this tactic is quickly copied. How about “canned” laughter and applause? One observation: Network Ten’s wardrobe department needs a major overhaul. Another observation: a couple of toilet cubicles and the lunch room could do with a bit of a paint. What a joke – Ten is obviously scared of releasing the numbers. By comparison – Seven and Nine probably have 1.8 and 2.0 million viewers in the timeslot respectively if they add their three channels. I assume that Ten are giving advertisers free and equal weight on both Eleven and One – otherwise this is just “trickery” ! !